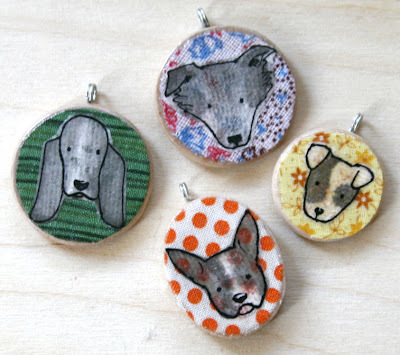 It's about time I started a Dog series of decoupage wood pendants. My first one was the top circular pendant featuring my very own Charlotte on a floral background. I picked a few other dogs that I thought would be fun to draw. These are decoupage pieces as before, but in addition to the pen and ink to outline the dogs, I used an ink wash with a paintbrush to give a sense of the coat patterns. I figure people would like to have individualized pen portraits of their own dogs. I'm contemplating the idea of making such pendants on the spot, say at a craft fair. Everyone has cell phone pics of their dogs these days - I could whip out a drawing in five minutes. It's the pasting and layering of glue and varnish that takes a while. The fabric backgrounds on wood could be pre-made. Just wondering aloud.